The Holocaust Memorial, formally known as the Holocaust Memorial of the Greater Miami Jewish Federation, is a labor of love by a small group of Holocaust survivors who came together in 1984 to develop a permanent memorial in the city. The group established a private nonprofit organization and decided on Miami as a location given the high concentration of Holocaust survivors settled in the city. 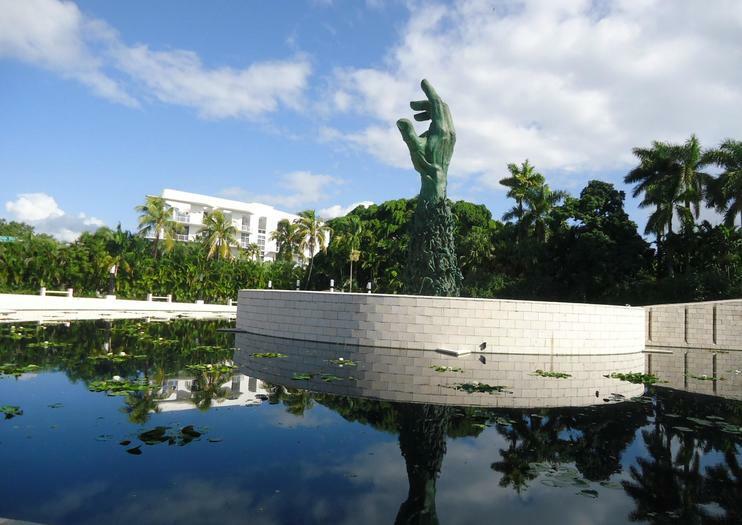 One of the most important elements of Miami’s Holocaust Memorial is the Sculpture of Love and Anguish, a giant bronze representation of an outstretched arm, rising from the earth and stretching to the heavens. The entire area is made up of vignettes of family members trying to help each other in a final act of love. The Memorial Wall is a somber reminder of the lives who were lost during the Holocaust. It’s the only link for many survivors to their families, a place they can see their loved ones’ names carved on a remembrance memorial. Holocaust survivors serve as docents, offering testimony and explanations to visitors, and the memorial offers lectures, seminars and school tours. Interestingly, the location includes the street numbers of 1933-1945, numbers matching the exact years of the Nazi regime. The Holocaust Memorial of the Greater Miami Jewish Federation is located at 1933-1945 Meridian Avenue in Miami Beach. It is open daily from 9am to sundown, and admission is free. Discover the best of Miami and its most popular neighborhoods on this guided, 4-hour bus tour around the city. Admire the sun-splashed skyline of downtown Miami, stop at the Bayside Marketplace and visit the popular and glamorous South Beach neighborhood and famous Art Deco District. Enjoy the vibrant, Cuban atmosphere of Little Havana. Drive through Coconut Grove, the oldest continuously inhabited neighborhood of Miami. Learn about Miami’s history and culture from the local driver/guide and make several stops along the way for photos. Miami Beach hotel pickup and drop-off included. With its flat layout and vibrant street life, Miami is a dream for bikers. Get a close-up look at the city’s attractions on this 2-hour bike tour, which includes commentary from your guide for a ride equally informative and fun.